Great protection for the gladiator in the Coliseum. Made from age dyed brown leather. 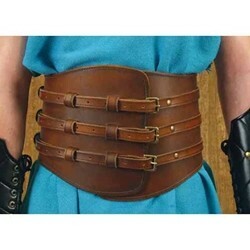 Belt has three adjustable straps with antiqued brass buckles for a secure fit. Comes in S/M or L/XL sizes.